GENERAL SANTOS CITY — A former long-time Catholic bishop of the provinces of South Cotabato, Sarangani and this city succumbed to an illness before dawn on Sunday. 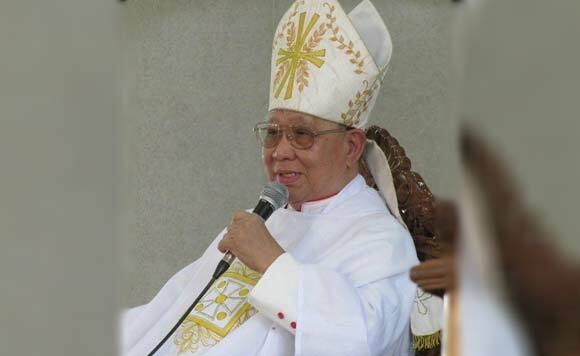 Retired Bishop Dinualdo Gutierrez, 79, of the Diocese of Marbel, passed away at around 5:03 a.m. at the General Santos Doctors’ Hospital here, incumbent Bishop Cerilo Casicas announced. “It is with great sadness that I announce the death of Most Rev. Dinualdo Gutierrez, Bishop-Emeritus of Marbel,” Casicas said through an advisory issued by the Catholic Bishops’ Conference of the Philippines (CBCP). “Please pray for the repose of his soul,” added Casicas, who did not cite the cause of the former bishop’s death. But diocesan priest Fr. Raul Vale said in a radio interview that Gutierrez had suffered from complications of prostate cancer and chronic obstructive pulmonary disease. was in and out from the hospital here. “He was again rushed to the hospital several days ago but his body was already weak. He’s now at rest,” Vale said. The soft-spoken Gutierrez, who would have turned 80 on Feb. 20, retired on April 28 last year after serving the diocese for over 36 years. The former bishop was born on Feb. 20, 1939 in Romblon and ordained as priest on April 7, 1962, at the Immaculate Conception Cathedral of Roxas City, Capiz. He was appointed by Pope John Paul II as Coadjutor Bishop of the Diocese of Marbel on Nov. 19, 1980 and ordained bishop two months later. Gutierrez assumed as bishop of the diocese by succession on Oct. 1, 1981. As bishop, he headed the CBCP’s National Secretariat for Social Action and served with the Episcopal Commission on Indigenous Peoples, Episcopal Commission on Social Action, Justice and Peace and member of Episcopal Commission on Social Communications and Mass Media, among others. bishop GutierrezCatholic bishopCBCPCerilo CasicasDinualdo GutierrezGeneral Santos CityGeneral Santos Doctors' HospitalRaul Vale.